Last summer I read a book called Fury that I loved. The theme was revenge, which was very interesting to explore, but what I really loved about the book was the setting and the major twist at the end. So, I'm excited that the sequel, Envy, is out soon, and I'm happy to announce that thanks to Paper Lantern Lit, I am offering a signed copy as a giveaway! If you don't know what Fury is about, click here to read my review. 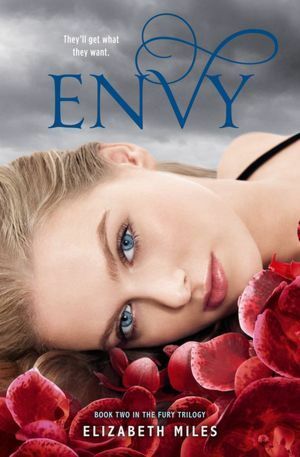 And read on to learn more about Envy! "The Furies are back in the second book of a chilling paranormal trilogy where revenge rules the day—and “sorry” isn’t going to cut it. It’s tempting to be naughty. But beware: the Furies are always watching, and their power grows stronger by the day." Sounds awesome, right? Well, all you have to do to enter is comment below and tell me...if you had the opportunity to exact revenge against someone who did you wrong, and you knew you'd never get caught, would you do it? The contest ends August 15th! U.S. residents only, please! If you tweet/Facebook, let me know in your comments for extra entries! I have to say I think I would exact revenge. It would too sweet of an offer to pass up. I wish I was a better person, BUT…I would definitely get revenge. I'd like to say no I'm better than that and that by seeking revenge I'm stooping to their level BUT a part of me thinks I'd jump at the chance!!! I wouldn't do it; I might not get caught but what goes around, comes around and I'd pay eventually. Saying that, I really enjoyed Fury for its different concepts and am excited to see how the series continues. I would SO do it - to one particular person who made my life hell and who deserves it - nothing too awful but just a constant reminder that he is a total idiot. Yeah, I'd go for a dose of sweet revenge if someone did something absolutely terrible to me. Ah! Such a moral question. I want to say that I wouldn't do it, but if the person did something absolutely unforgivable, I'd probably have a bit of revenge. It would probably depend on what they did. Revenge IS sweet! It probably makes me a terrible person, but most definitely yes.